Singha wrote: livefist - chutzpah and arrogance from LM! "The fifth generation JV with Russia? Yeah, well all I can say is best of luck with that," Griswold said. Lol. How dare does someone call into question the FGFA or Indo-Russian joint ventures. Does the MKI have MAWS? If not, how will the MKI driver know if an LPI radar has cued SAM/AAM towards it? Added later: Even if not LPI, how will the MKI driver know missile(s) are on the way? Rakesh wrote: This is the first time an aircraft carrier is being built in India...expect delays. This is also the first time modular construction is being attempted in India... Hope springs eternal. The pics of MDL's launch ceremony showed modules that were structurally complete to a high degree. N-LCA can use all the takeoff thrust it can get in order to have any significant load and/or endurance off a non-cat carrier. I believe the F-414 EPE offers the most thrust from any of the LCA compatible engine families (M-88, EJ200 and F414). This link is saying that the Russian Il-476 tanker version won the IAF tender for six new aerial tankers. NRao, I believe THIS is what you are refering to. Note that in the begining of the issue, there's a small blurb about the IAF being the first customer for the new Il-476 aerial tanker version. Man, I'm so tempted to say something right now but will hold my tongue. I love it when I'm right though! Gerard wrote: Welcome to McArmy! Is that author complaining that the US soldiers are eating too well on the field? That's an odd thing to complain about. Wonderful pics. Some of the best aircraft pics I've seen, not just the best Tejas pics. shiv wrote: I can see no Sanjay Simha pics in that gallery. Did you mean Vijay Simha Reddy's gallery? You are absolutely right! It is Vijay Simha Reddy. Apologies to all concerned, especially Vijay. The H-2B is expected to be able to release an HTV weighing up to 16.5 tonnes into orbit as well as satellites with a combined weight of eight tonnes. Did they show the C-17 moving backwards under its own power? I believe it is the only jet that can move backwards. 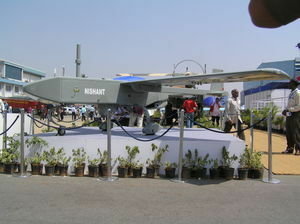 Nishant (Mk II)? will have CTOL capability and not the catapult launch and parachute recovery.